Editor's Note: Below is a transcription of Senior Macro analyst Darius Dale's recent appearance on CNN Business's "Markets Now" segment. CNN Host Alison Kosik: You’ve got a sort of downbeat prediction here about earnings for the full year. Tell me about that. 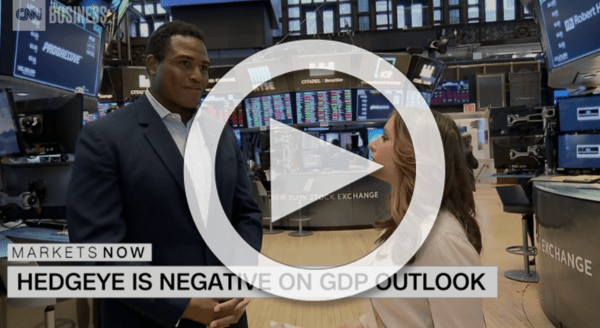 Senior Macro analyst Darius Dale: Yes, we definitely think there’s downside risk to a shallow corporate profit recession here in the U.S. economy for three reasons. One you continue to see labor’s share of national income accelerate and through the end of this economic cycle. Two you have really tough U.S. Dollar comparisons so right now we have the U.S. Dollar which obviously roughly half of the S&P 500 revenue and EPS are obtained from abroad. With the U.S. Dollar up 9% in Q1 and potentially up 6-7% year-over-year in Q2 that’s a material headwind as well. And obviously we’re likely to have global growth continue to decelerate. So domestic economic growth is likely to continue to decelerate through at least 3Q 2019, when you have Chinese economic growth hitting it’s nadir here in Q1 and European growth potentially teetering into a recession. Kosik: Ok, but you’ve got a lot of people scratching their heads here about this prediction for a shallow earnings recession. So far results have been pretty solid. Obviously we’re not seeing the double-digit gains that we saw last year. What quarter do you start to see things crater? Dale: I liken this to Procter and Gamble raising their guidance today. You go back to this time last year and you have Caterpillar beat and raise their guidance and then only a month later have to come back and revise down their estimates for the full year. That’s something that we can actually see. You’re going to see some of these key headwinds coalesce here in Q1 which obviously won’t start to be reported until April. Kosik: Ok so your outlook for GDP also seems pretty downbeat. How related is that to the government shutdown? Dale: None. The government shutdown is actually having a very negligible impact on growth. But what we’re seeing in the U.S. economy is a return to more normalized levels of growth off the difficult comparisons that we put up in 2018. China has a myriad of structural headwinds that continue to weigh on growth, not the least of which are these trade concerns with the U.S. But it’s far from trade. It’s obviously a myriad of things we’ve been discussing with our clients. Europe potentially going into a recession is obviously another key headwind as well. Kosik: What do you see are the biggest risks to the market right now? Dale: Global growth decelerating and a potential shallow earnings recession in the U.S. are two pretty big things I don’t think investors are pricing in at this level of the S&P.